NARS is constantly innovating from its formulas to its color options. The NARS Exposed Cheek Palette is the brand’s latest “must get” product. 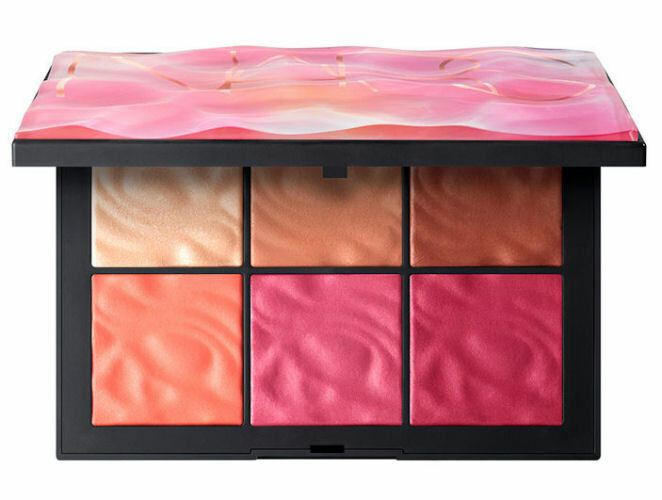 It boasts six square pans of blush in pink, peach, beige, and gold tones. It’s an excellently executed mix of brights, neutrals, satins, and pearlescents. Ultimately, each shade looks like a cream but feels silky when applied, like a powder. The product itself has a rippled texture with peaks and valleys. That way, when you swirl your big, fluffy brush over your shade of choice, it will pick up the right amount of pigment. You can go crazy and swirl your brush over several shades for a custom flush or glow. The formula is buildable so you can go for a little wash of color on cheeks or high points of the face or you can add multiple layers of product for a dramatic glow. Your visage will legit look lit from within. It’s a limited edition palette so be sure and grab it before it’s gone for good. There’s enough product to last you well deep into the year and that’s always a good thing. Get the most bang for your buck and a flirty flush on your visage.